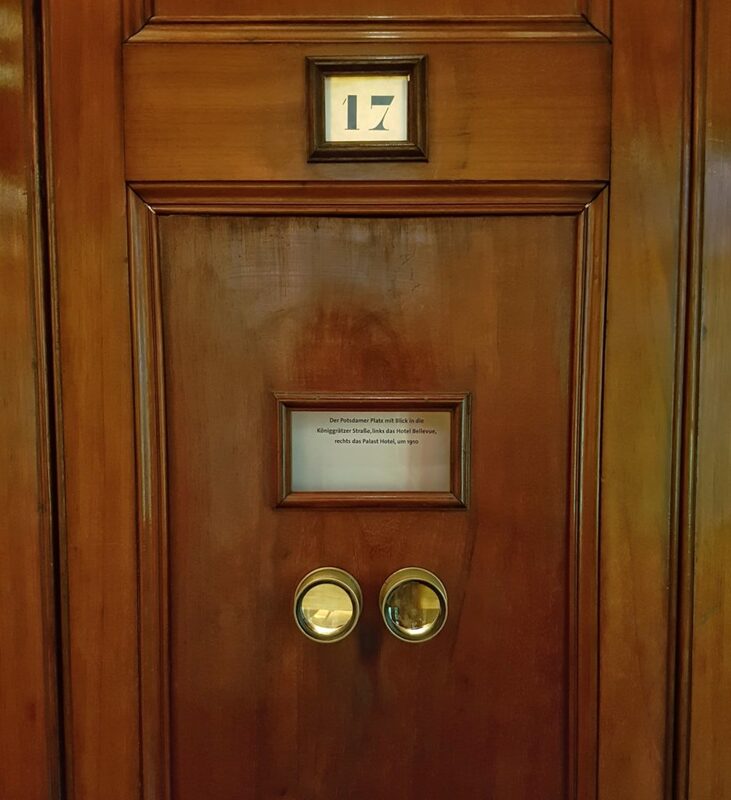 I went looking for the little bell that Benjamin described in his autobiography and found it in a nearly empty room in a back corner of Mitte’s Märkisches Museum, pinging and dinging away every half-minute with a dogged devotion to schedule, needing no audience for its performance. Though I knew it couldn’t be true, I imagined that this lumbering wooden machine had been trundling away in this forgotten corner for the last 130 years, its little bell an insistent echo from another era, like a ghostly conductor continuing to signal a train that had departed for the last time many, many decades ago. 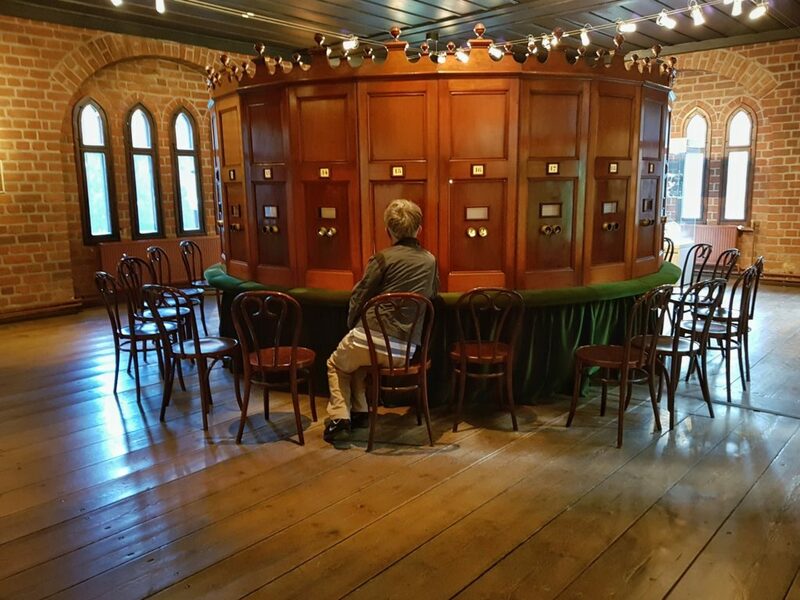 When I obeyed the ringing of the bell and took a seat at the Kaiserpanorama, resting my elbows on the ledge upholstered in green velvet and leaning toward the brass-rimmed eyepieces, willing my eyes to focus on the mysteries in wait just inches away, it was like peering through a peephole into the past. 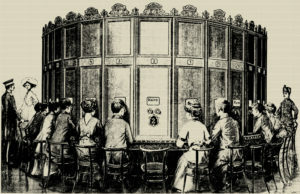 The Kaiserpanorama was the brainchild of German physicist August Fuhrmann, whose dream was to bring the thrill of the big, wide world out there to the common man at home. 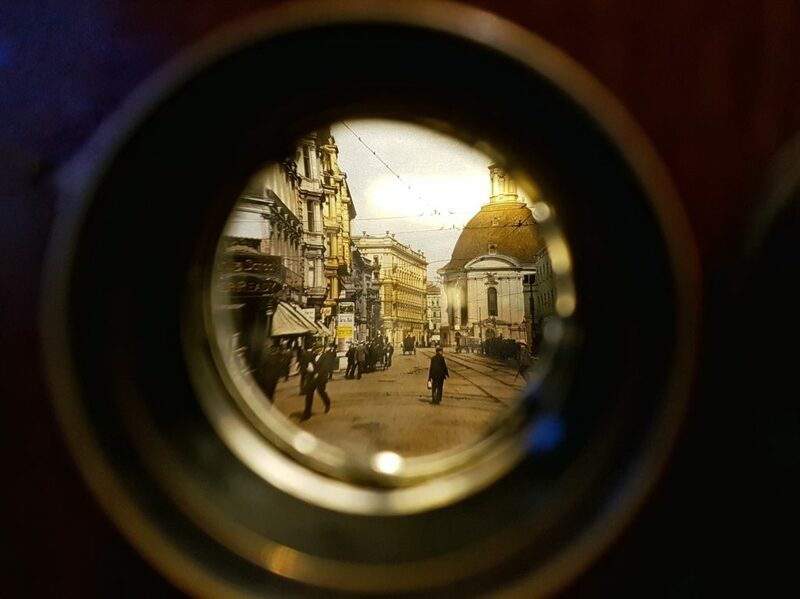 His invention was a rotating contraption that showed 3D stereoscopic photographs of exotic, faraway places, mounted on glass and painstakingly colored by hand, to multiple viewers at a time. 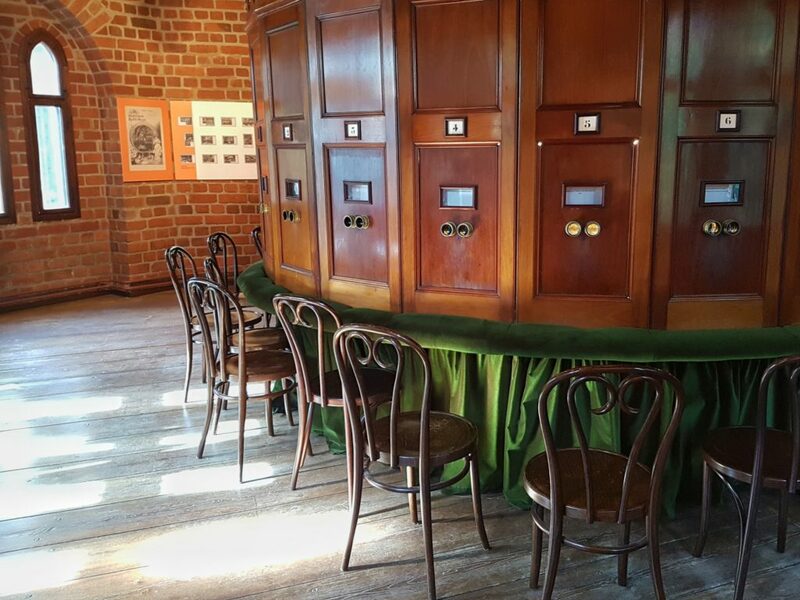 Around a tall, circular, wooden frame carved to look like a crown were 25 chairs, set before 25 sets of eyepieces. Behind the frame ran a simple engine that rotated in a loop, pausing the images at each viewing station for 30 seconds at a time. The photos were swapped out every couple weeks, allowing repeat visitors to glimpse something new the next time they came. For a time, before the world of movies exploded, Fuhrmann’s contraptions were a hit. 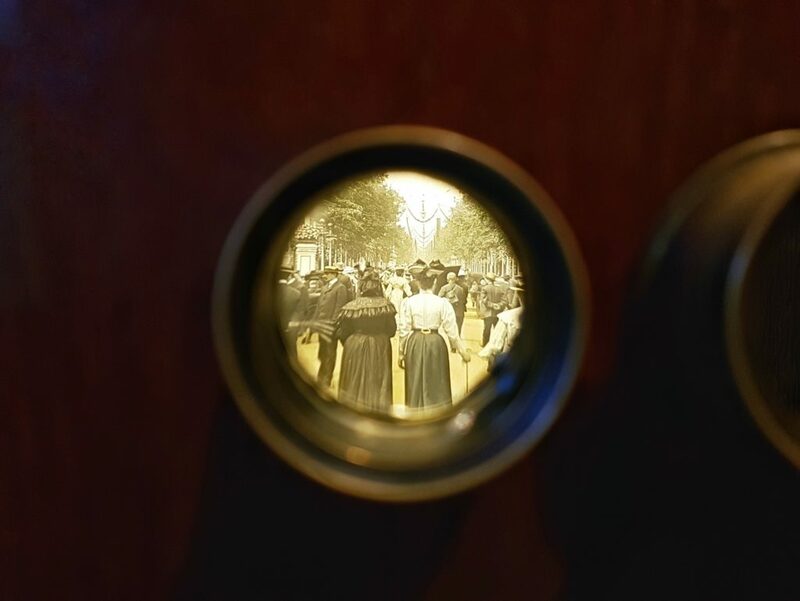 Berlin’s Kaiserpanorama, which sat in a grandiose passage off Friedrichstraße from 1883 to 1939, promised “Optisches Reisen” – visual travels – for 20 pfennigs a person (10 pfennigs for children). By 1907 there were nearly 250 Kaiserpanoramas all across Europe, and Fuhrmann sent photographers to all corners of the globe to shoot the photos for his image bank, building up a collection numbering 100,000. 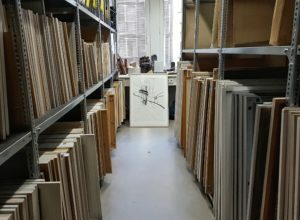 Today, only a few Kaiserpanoramas are left in a handful of dusty museum collections around the world, including the one at the Märkisches Museum, which spins a steady carousel of photos illustrating life in Berlin on the cusp of the 20th century: military parades for the Kaiser, pedestrians milling about on Unter den Linden, that kind of thing. As for the exotic, faraway photos Walter Benjamin and his contemporaries would have viewed, the “mountains with their humble foothills, the cities with their mirror-bright windows, the railroad stations with their clouds of dirty yellow smoke,” this website offers a glimpse into August Fuhrmann’s stereoscopic archive.